Originally from France, Grégoire has been living in New York since the age of 10. His work has been imprinted by the city's urban landscape and vibrancy. Whether through his collages, neighborhood series or custom made alphabet pieces, his art resonates with urban scenery and typography. Grégoire currently lives in Brooklyn, with his wife and three daughters. Grégoire's Cityscapes are unique compositions that play with light,reflections and the urban landscape. The Cityscapes offer candid and alternate views to some of the city's most famous scenery.The way Grégoire depicts them puts forward the city's vibrant spirit. His main body of work was created in New York and Brooklyn. Stay put for new work from other urban territory. All images featured can be printed in various sizes and are limited editions of 25. Grégoire's latest series highlight several of New York and Brooklyn’s neighborhoods capturing their architecture and spirit one frame at a time. 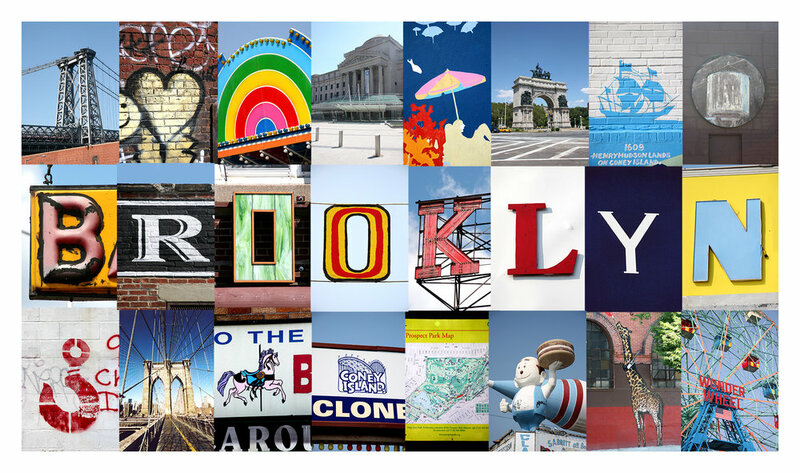 Each letter and image within each collage is taken in that particular neighborhood resulting in a unique visual representation. Every image is available in both postcard and print format. All images featured can be printed in various sizes and are limited editions of 100. Gregoire created his Léa’s Alphabets collection after the birth of his first daughter in May of 2003 as he was inspired to look for original decoration for her surroundings. The culmination of this process resulted in the creation of “Léa’s Alphabets”, a collection of photographic collages geared towards decoration and education for children of all ages. The complete collection includes alphabets, illustrated alphabets, illustrated color images, as well as custom-made name collages. Each collage is made up of individual photographs, representing letters and illustrations captured from everyday life. The result is a unique image, filled with vibrant colors and diverse shapes. Grégoire creates his custom name images after consulting with his clients to present a truly unique and custom project. The customers are able to review and participate in the creative process, as well as to include personal images. Grégoire has worked on many personal project for children, families, companies and organizations and would be thrilled to work on a proof for your personal projects. All custom projects can be printed in various sizes and are unique to the client.